Tax preparation has come a long way since the days of service bureaus, couriers and paper forms. Personal computer-based tax software allowed tax returns to be prepared entirely in-house. Now, some tax document automation solutions are allowing firms to embrace a completely digital tax practice. Through Optical Character Recognition (OCR), source documents like W-2s, K1s and brokerage statements can be scanned and automatically bookmarked and organized. Then, the relevant tax data from those source documents can be exported to tax software. If your goal is increased efficiency, the time you save with a Digital Tax Practice by not having to organize your files and key punch data into tax software is important, very important, but it isn’t the most important component of a truly automated digital tax practice. To understand the most important component, think about how and when a 1040 tax return flows through your office. With most tax document automation solutions the process works like this: You scan the paper documents that were provided by your client then you run the scanned documents through OCR. What you receive as a result is an organized PDF file that can be opened in a PDF editor like Adobe Acrobat. This process would be sufficient if you received all of your client’s source documents at the same time and those documents were the only files that you used to prepare the tax return. Unfortunately, that’s not a real world scenario. In the real world clients deliver documents piecemeal. Late K1s and amended 1099s might come weeks after the initial shoe-box is delivered. With Adobe Acrobat, incorporating those late documents into the original bookmarked PDF is cumbersome and time consuming so instead you create a new, separate PDF. If you receive a third set of late documents from the client you create a third, separate PDF. Think about the inefficiency of this process. 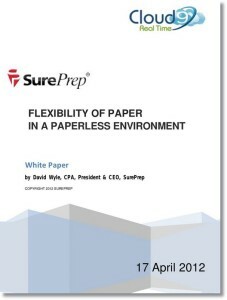 Would you ever create separate paper files for the same tax return? And what about Digital Tax Practice workpapers that don’t get scanned at all? An IRA deduction computation worksheet in Microsoft Excel. Maybe you have some tax research in Microsoft Word. What about an email from the client? A PDF editor will not support those different file types. In order to maximize the benefits of tax document automation technology you need a workpaper tool that allows you to build a comprehensive tax binder containing many different file types. Adding late documents to your workpaper file should be quick and easy. Annotation tools and signoffs that work across scanned documents plus Excel spreadsheets, Word documents and emails should be standardized and easy to use. Adobe Acrobat does not fill these important requirements. Therein lies the problem with what many vendors offer the Digital Tax Practice. The time you save in automating the organization of source documents and the extraction of relevant tax data is lost when you’re left to navigate clumsy workpaper tools that were not designed with accountants in mind. That’s why SurePrep created SPbinder, the workpaper tool that is included with all three versions of 1040SCAN. There are two key questions to ask when evaluating tax document automation solutions. First, how complete is the vendor’s document coverage list? Second, and most importantly, what workpaper tool will I use when preparing and reviewing the tax return? Evaluating a vendor’s document coverage list is fairly straightforward. Document coverage lists show you which source documents can be automated. Some solutions automate just a few document types like W-2s and 1099s while others recognize an exhaustive list of government forms. Each additional document type equals incremental time savings so pay close attention to how many documents the OCR solution can recognize. The longer the list, the greater the time savings. Greg Pope is the Marketing Director at SurePrep, a leading provider of productivity solutions to the tax and accounting profession. He is responsible for the planning, development and implementation of the company’s marketing strategy and communications. Greg has worked in the tax and accounting industry since 1999.